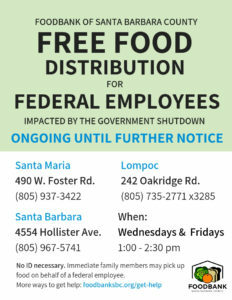 We are holding FREE food distributions in 3 locations for federal employees affected by the government shutdown. No ID necessary. Immediate family members may pick up food on behalf of a federal employee. For more ways to get help, please visit https://foodbanksbc.org/get-help/. This entry was posted on January 15, 2019 by Hailey Phelan.